You�re viewing our Sausage Maker non-fat dry milk � 1 lb. 8 oz. 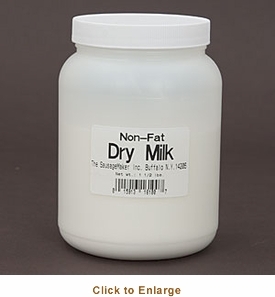 TSM's non-fat dry milk is a fine powder that has the consistency of corn starch. Use when making quality homemade sausages and luncheon meats. Non-fat milk was used years ago by sausage makers before Soy Protein Concentrates were available to help cut shrinkage and improve moisture retention in meat. 1 lb. 8 oz. 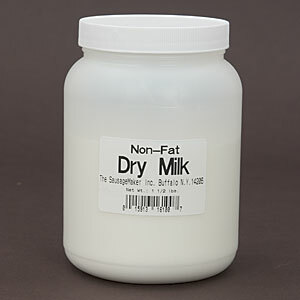 of dry milk will process up to 50 lbs. of meat. We can answer any questions you may have about our products. Scroll down to view our Sausage Maker non-fat dry milk � 1 lb. 8 oz.